An unusual large galaxy with a shape bordering betweenspiral and elliptical has been spotted by NASA's Hubble Space Telescope. NGC7049 sits in the southern constellation Indus, and is the brightest of a clusterof galaxies, a so-called Brightest Cluster Galaxy (BCG). Typical BCGs aresome of the oldest and most massive galaxies, which provide excellent opportunitiesfor astronomers to study the elusive globular clusters lurking within. The halo, a ghostly region of diffuse light surroundingthe galaxy, is composed of myriads of individual stars and provides a luminousbackground to the swirling ring of dust lanes surrounding NGC 7049's core. Small faint points of light sprinkled throughout thegalaxy represent globular clusters, which are gravitational groupings ofseveral hundreds of thousandsof stars. They contain some of the first stars to be produced in a galaxy. 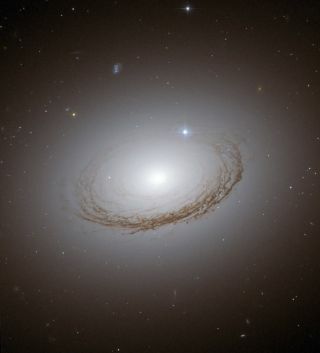 NGC 7049 has far fewer such clusters than other similargiant galaxies in very big, rich groups. This indicates to astronomers how thesurrounding environment influenced the formation of galaxy halos in the earlyuniverse. Hubble captured this image using its Advanced Camera forSurveys, which is primed to hunt galaxies and galaxy clusters in the remote andancient universe. The space telescope recentlyimaged a group of colliding galaxies chosen in an online voting contest.